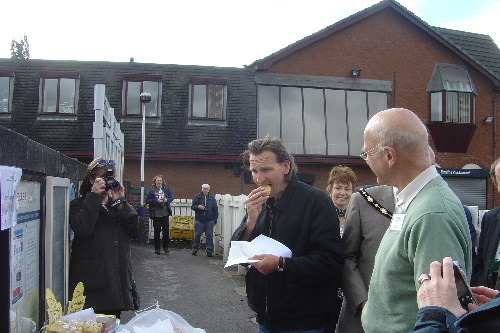 A highlight for Freccles was reached on Monday September 24th 2007 when star of stage, screen,& TV, Christopher Eccleston, officially unveiled the mural, which was specially commissioned by Freccles to help improve the visual image of the station. 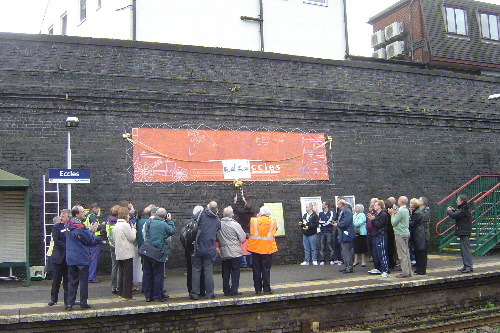 The mural was designed to Freccles requirements by students from Eccles College. As a former student; Christopher Eccleston was pleased to lend his support for the College and Freccles. The ceremony was attended by the Mayor of Salford, Councillor Valerie Burgoyne, representatives from Greater Manchester Passenger Transport Executive (GMPTE), Northern Rail and the Association of Community Rail Partnerships (ACoRP) as well as other community representatives plus staff and students of Eccles College. The Chairman of Freccles, David Yates, opened the proceedings before handing over to Eoan Edwards, Treasurer and leading light behind the project. 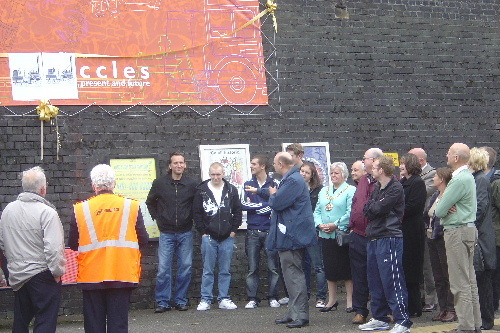 Stuart Wattam, Principal of Eccles College, spoke about the project before handing over to Christopher Eccleston to officially unveil the mural. The whole event was a great success and was a significant step forward for Freccles, both in terms of improving the image of the station but also raising the public profile of the group. and to Eoan Edwards for all his hard work in making this project such a success.